LAS VEGAS—AMD said Monday that the two new members of its A-series "Kaveri" chips are now available for preorder, and launching January 14. But the biggest update to its new hybrid CPUs with integrated graphics may be one of terminology. AMD also revealed a couple of surprises: the Discovery Project, a sleeve that designed to plug into and enhance AMD-based tablets, and an envelope-sized PC prototype that uses one of AMD's next-generation ultrabook chip, code-named "Mullins." AMD also announced three new mobile GPUs for notebooks, including the R9 290 GTX—which will be included in gaming machines from MSI, Alienware, and Gigabyte—and the R5 M230. 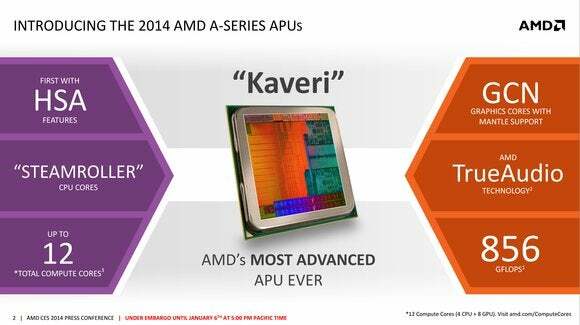 AMD is expected to take on Intel's Core architecture with benchmarks demonstrating Kaveri's performance. To date, AMD has struggled to hold its ground against mighty Intel. Kaveri may just be the answer—or it might not.